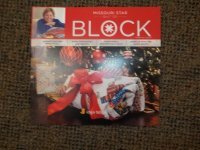 Finally, our BLOCK magazine is here!!! We are disappointed the Christmas magazine arrived after Christmas; however, the patterns will NOT disappoint you. Beth and I both feel this magazine is one of her best. I think there are at least 5 patterns we want to start today! It is hard to believe the New Year is upon us! What a great year we have had at Quilter's Garden! We want to take this time to thank all of our wonderful customers for your continued support. We know there are many options out there and we appreciate you shopping with us!